New York, April 3: The US has approved the sale of 24 submarine-hunting MH-60R Seahawk Multi-Mission helicopters to India in a $2.6 billion deal aimed at strengthening their strategic relationship, according to the Defence Security Cooperation Agency (DSCA). The DSCA said on Tuesday that it received the approval from the State Department for the sale and it has notified the Congress about it. "India will use the enhanced capability as a deterrent to regional threats and to strengthen its homeland defence," it said. The helicopters, nicknamed "Romeo", will give India the capability to perform anti-surface and anti-submarine warfare missions and also perform peacetime operations like search and rescue. While the approval has been granted for the sale, it is yet to be concluded, the DSCA added. India's Submarine Deal with Russia Raised by Some US Congress Members with FS Vijay Gokhale: Sources. The agency indicated that offsets, which usually require some parts of the equipment or something similar to be manufactured in the country buying the equipment, could be a part of the deal. The DSCA said: "The purchaser typically requests offsets. Any offset agreement will be defined in negotiations between the purchaser and the contractor". "This proposed sale will support the foreign policy and national security of the US by helping to strengthen the US-Indian strategic relationship and to improve the security of a major defensive partner which continues to be an important force for political stability, peace and economic progress in the Indo-Pacific and South Asia region." However, the agency added that "the proposed sale of this equipment and support will not alter the basic military balance in the region". The approval for the sale comes as India and the US strengthen their strategic cooperation, with President Donald Trump raising India to the status of a major defence partner in his administration's vision for a secure Indo-Pacific region buttressed by the two major democracies at either end. China is becoming more assertive in the region and also expanding its reach beyond it, making the US look to allies for enhancing regional security. 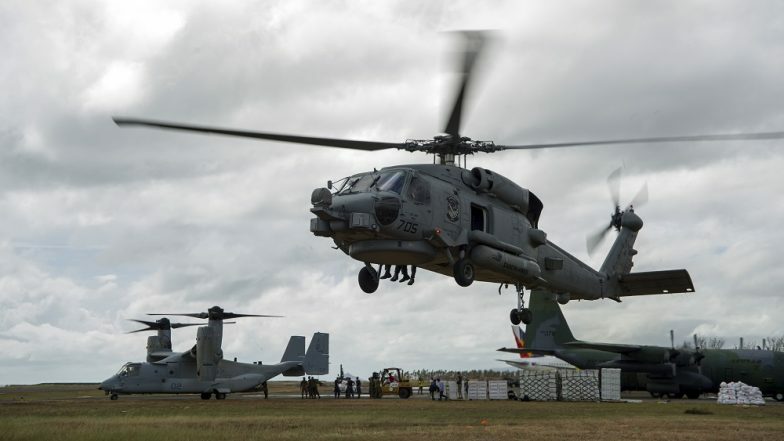 According to Lockheed Martin, 300 MH-60R helicopters are in operation around the world with the navies also of Denmark, Australia and Saudi Arabia.